Discussion in 'World Championships' started by homeofmew, Jul 31, 2008.
ok I am not talking about the offical POP/PUI Turtwig, Chimchar, Piplup and Pikachu roaming about. I know I am going to be Pikachu and Duke fire bird wants to be jirachi. is anyone else gonna dress as a pokemon? Of course, I could always say that I'm a jigglypuff. And when I sing people fall asleep. I'll be going as Lantron one day.. And The Ace the next..
Pokemon No Baka: I got a chuckle from your post! I'll be Gengar and Nurse Joy. Besides that I'll be impersonating CameraMan a bit as I too will be running around with my camera. But that is the just about funnest job in the whole event. I loved being Meowth in '06. They hired professionals for '07 so i didn't get that role last year. Instead I watched over the nursery which it turns out is even more fun. I have seen those costumes. They are small and hot. you can't breathe in them and can't stay in them for long. being a NON POP/PUI pokemon is more fun too because that means you actually like pokemon and you don't need to be bribed pop/pui by goodies. Cosplaying is all about the fun and fans. Sure there is always gonna be paid cosplayers, and cosplay invites. You do have a point about going out of your way to cosplay, but I should let you know that being a volunteer does not get you paid. Goodies are rare too. I didn't get any bonus last year for being a volunteer other than a T-Shirt that said I was a volunteer. The fun part about it is seeing the joy on children's faces as you walk into the room. The joy it brings them. I am a giver at heart. I am always happiest when I am making others happy. That is what I truely find fun. That is also why I choose not to play in any Worlds events. I would much rather volunteer. If Abby can find a new Pikachu hat she is going to dress. She has the bottom. Other wise we are going to look and see what we can find for our little 7 year old. 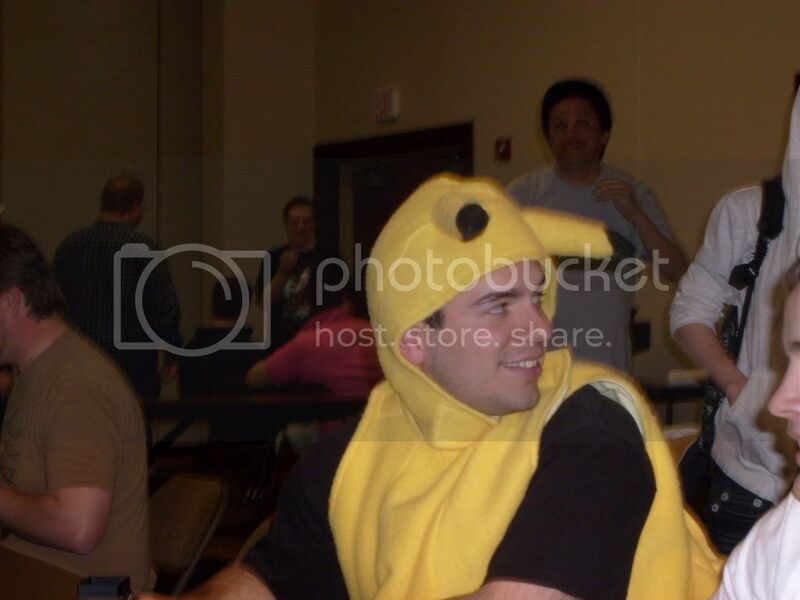 Someone get AJ to put on his Pikachu costume!! he joy it brings them. I am a giver at heart. I am always happiest when I am making others happy. yep ^_^ but I like going to conventions as pikachu not be a volunteer or anything just a regular convention goer. 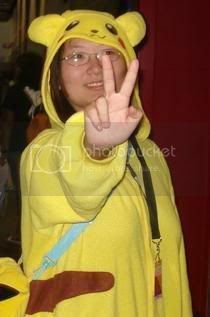 I really like being pikachu, I can be myself and no one really cares. here's a picture that I show to a lot of people. THIS is the reason I cosplay as Pikachu. 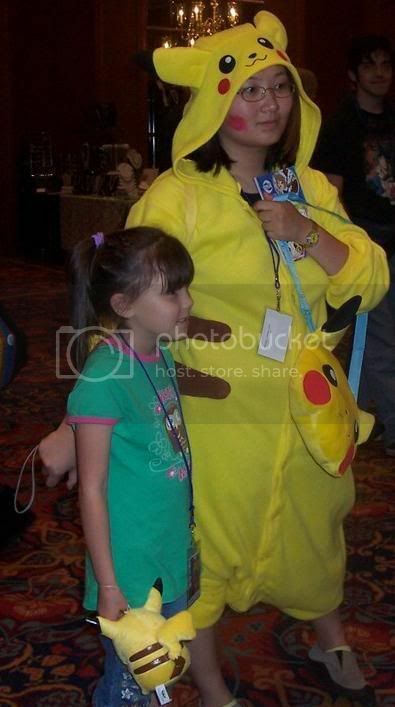 That little girl was so happy ^_^ and she has a Pikachu doll too! If worlds were in my budget this year, I would definitely opt to bust out the Lucario suit again. I plan to wear it one of the days at nationals next year. I think it will be pretty fun to do so. Is it possible to cosplay as a Gardevoir or Gallade without simultaneously dressing in both the masculine and the feminine? I understand that they are both male -and- female.. If your a girl do Gardy. I remember them last year... The turtwig died lolz, it rolled onto it's back and couldn't get back over. So they had to get some trolley looking thing and push it into the staff only room haha .